“Jon Chang is the writer of the very realistic Black Powder Red Earth graphic novel series, about American mercenaries in a near future Middle East. He is also Chief Creative Officer at Haley Strategic Partners, a tactical equipment training and design firm.” That is how Chang was introduced at a panel event hosted by the Atlantic Council in Washington, D.C. 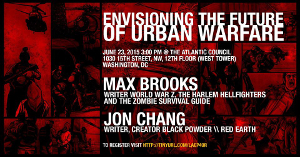 The event was for something called the Art of Future Warfare project, and the subject was “Envisioning the Future of Urban Warfare.” He was joined on the panel by Erin Simpson, CEO of Caerus Associates, and Max Brooks, author of World War Z. What wasn’t mentioned, along with his other accomplishments, was Chang’s history as a songwriter and performer, notably for Discordance Axis and GridLink. That’s the part of Chang’s work that we’re most familiar with. We reached Chang via email to get his thoughts on the event. We’re used to thinking of Chang screaming and growling into a mic in front of a band, but we asked if being on a panel in front of an audience, and participating in a Q&A, was a type of performing. “World War Z is a global brand, even before the film was made, and Dr. Simpson’s work has informed policy and strategic decisions at the DoD, DoS and Executive Branch among others. Black Powder Red Earth has been a personal project that I have been using as a platform for a lot of projects with the hopes that even one touches on the success that my fellow panelists have enjoyed. Maybe one day, people will not require their comic books to be filled with capes and costumes living out thinly veiled social commentary that rarely goes deeper than your average soap opera. “But something Max Brooks said during our lunch [before the panel] resonated with me. I am compelled to write comic books like Black Powder Red Earth because no one else is. Even now, few people realize how many GridLink songs were about the war. No one is telling stories about what is happening all around us, possibly because Americans don’t want to hear it. I find more and more that people speak in broad strokes about ideas with little specific knowledge about the things they are commenting on. “Today’s games and narratives don’t challenge us. They’re not honest with us. They don’t even give us the same credit as rats in a maze get. They are dumbed down so we can feel good about ourselves and reassure us that how we see the world is right. “If you sit through something and it doesn’t change the way you see yourself or the world, then to me, that is wasted time. I felt the same way about music. It’s why I wasn’t an exactly beloved person in my given genre. But I don’t need people to like me. I need them to find significance. Here’s the video of the event, posted by the Atlantic Council. Chang noted for us that he wore an Arcteryx Veilance blazer, pants and shirt to the event. – We interviewed GridLink for their final album and tour. – We posted links to Discordance Axis guitar tabs and a book about the band’s last album. This entry was posted in Interviews, Politics + Music and tagged Black Powder Red Earth, Discordance Axis, GridLink, Jon Chang by Editor. Bookmark the permalink. You had to go there on the suit.